Are your stamps on the verge of becoming a World-class-looking collection? Shouldn't they be housed in elegant albums that showcase the quality of your collection? It might then be time to upgrade your collection to one of the best-made albums in the world. With few exceptions, the best albums in the World are European made, with the majority of them being manufactured in Germany. Expensive? Yes, they're pretty expensive, but, as the old saying goes, "you get what you pay for"! If you want your stamps to look and feel their best, there are no better quality album products on this planet! There are a number of different brands, all of excellent quality. The binders, page units, slip-cases, etc. are all sold separately for each country album. Most of the manufacturers offer both spring-back and post binders, and the newer pages are interchangeable with either type. 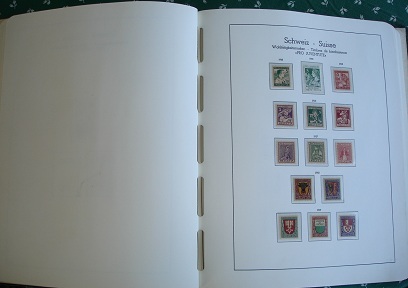 I prefer the spring-back type binders, as shown in the image of one of my Schweiz Lighthouse albums above. The pages of most of the brands are made of very heavy card-stock paper that should endure frequent handling for many years, and most of them are available with and without mounts. The majority of these albums feature the Michel Catalog numbering system and have Michel Catalog stamp arrangement. As I identify each of the album manufacturers on this page, all you have to do is click on the name, and the hot-link for that name will open a new browser window, taking you directly to the website. Lighthouse & KABE began in 1917, as the KABE publishing house, in Aschersleben, Germany. The firm closed in the 1930's but was re-established in 1948 as Leuchturm (Lighthouse) in Hamburg, Germany. They are among the finest publishers of quality albums and are still the largest exporter of stamp and coin collecting products today. KABE albums, which were introduced in 1997, is Lighthouse's premium brand, featuring linen hinged pages with mounts and heavy-weight spring-back binders. They have a distribution center located in New Jersey. Schaubek Verlag, in Leipzig, Germany, has been in the business of making stamp collecting products since 1871. Their extremely high quality album products are similar, in design and format, to those of Lighthouse. Their pages are interchangeable between screw-post and spring-back type binders. Davo Publishers, in Deventer, The Netherlands, began making single country albums in 1945. Davo albums feature quilted binders, which are the post-type and extra heavy paper. The pages come either with or without mounts. Davo products are available through many distributors in the United States. Lindner , in Schoemberg, Germany, began making albums in 1947 and maintains a distribution center in Syracuse, New York. They produce a whole line of stamp and coin collecting products, including their deluxe country stamp albums, featuring hingeless album pages and 18 ring binders. Their pages feature a separate sleeve containing the stamps, which is overlaid against a white paper album page. Stanley Gibbons is the oldest stamp collecting products company in the world, having been founded in 1856. Their specialized and country catalogs are world-renowned and are the standard for collectors of British Commonwealth countries. Stanley Gibbons makes a full line of stamp albums, primarily for Great Britain and British Commonwealth countries, which range in quality and price from very basic to deluxe.